Your hair is your power. It needs to be strong, radiant, and healthy. You can achieve this by nurturing it with the love and beauty care it needs. Our natural conditioner is here to pamper, strengthen, and revive your hair and scalp. 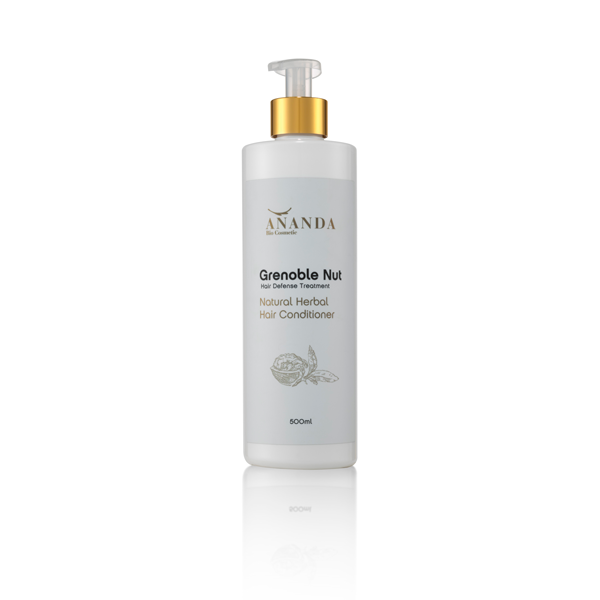 Its rich, precise combination of active organic ingredients, such as Moroccan argan oil, shea butter, silk protein, and extracts of sea buckthorn and pure French Grenoble nut, work to deeply pamper your hair. The advanced formula also features burdock root extract, known for its remarkable ability to combat hair loss, as well as additional herbal extracts for calming the scalp. Dry, sun-damaged hair, or hair damaged by chemical processes, such as straightening and color treatment, will be left intensely nourished, with a striking, rejuvenated look. Unlike products you’ll find in drugstores, this premium conditioner contains only natural ingredients. So use your time in the shower to relax and give yourself the love, tranquility, and care that you and your hair need, and really connect to yourself and your beauty care experience. Shlomit adds: After lathering with our Pure Shampoo, gently massage Natural Herbal Hair Conditioner into your hair and scalp. Rinse well with lukewarm water. I recommend using this conditioner once or twice weekly.